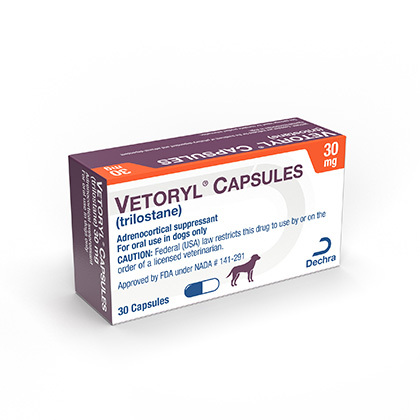 Vetoryl is used to treat dogs with hyperadrenocorticism (Cushing's Disease). 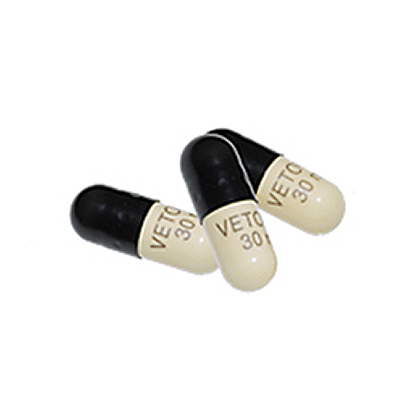 Vetoryl (Trilostane) is a competitive inhibitor of the enzyme 3-beta-hydroxysteroid dehydrogenase used in dogs for the treatment of pituitary dependent Cushing's Disease and Cushing's Disease due to adrenocortical tumors. It may be necessary to wait at least one month after discontinuing Lysodren before starting treatment with Vetoryl. Vetoryl requires a prescription from your veterinarian. Do not give this medication to dogs with kidney or liver disease. Vetoryl Capsules should not be given to dogs taking certain medications or dogs that are pregnant. Speak with your veterinarian about all medications your dog is taking, including over-the-counter medicines. What is the most important thing I should know about Vetoryl? Vetoryl is a prescription medication FDA approved for veterinary use in the treatment of Cushing's Disease. Vetoryl is indicated for use in pituitary-dependent hyperadrenocorticism. Vetoryl also has a Minor Use designation for treatment of Cushing's Disease caused by adrenal tumors. Vetoryl is available as 5mg capsules, 10 mg capsules, 30 mg capsules, 60 mg capsules and 120 mg capsules. The usual initial starting dose to treat Cushing's Disease in dogs is 1.0 to 3.0 mg/lb given once a day based on body weight and capsule size. For dogs weighing 3.8-10 lbs, give one 5 mg or 10 mg capsule once a day. For dogs weighing 10-22 lbs, give one 30 mg capsule once a day. For dogs weighing 22-44 lbs, give one 60 mg capsule. For dogs weighing 44-88 lbs, give one 120 mg capsule. For dogs weighing 88-132 lbs, give one 120 mg capsule and one 60 mg capsule, totaling 180 mg. For dogs weighing over 132 lbs, give the appropriate combination of capsules. Vetoryl should be given with food. After approximately 10 to 14 days, your pet will need to be re-examined and dosage adjustments may be required. Pets may require further re-examination at 30 days, 90 days, and every 3 months thereafter. What should I discuss with my veterinarian before giving Vetoryl to my pet? Tell your veterinarian if your pet has kidney or liver disease. Tell your veterinarian about any other medical problems or allergies your dog has now or has had in the past. Tell your veterinarian about any medications your dog is taking including over the counter products and nutritional supplements. Tell your veterinarian if your pet is pregnant, nursing, or if you plan to breed your dog. How should Vetoryl be given? Give this medication exactly as directed by your veterinarian. Give this medication with food. Do not open capsules and do not attempt to split or divide capsules. Wash your hands after use. Do not handle the capsules if you are pregnant or trying to become pregnant. If you do not understand the directions ask the pharmacist or veterinarian to explain them to you. What are the potential side effects of Vetoryl? If any of the following serious side effects occur, stop giving Vetoryl and seek emergency veterinary medical attention; an allergic reaction (difficulty breathing; swelling of the lips, tongue or face; hives), severe depression, bloody diarrhea, collapse, or other severe reactions. Other less serious side effects such as unexpected decrease in appetite, vomiting, diarrhea, and lethargy may occur. Other side effects may also occur. Talk to your veterinarian about any side effect that seems unusual or bothersome to your pet. What happens if I miss giving a dose of Vetoryl? What happens if I overdose my pet on Vetoryl? Seek emergency veterinary medical treatment. Symptoms of Vetoryl overdose may include lethargy, weakness, vomiting, or collapse. What should I avoid while giving Vetoryl to my pet? Do not give Vetoryl to dogs with kidney or liver disease. Do not give to pregnant or nursing dogs or dogs intended for breeding. Do not touch Vetoryl capsules if you are pregnant or trying to become pregnant. What other drugs will affect Vetoryl? Before giving Vetoryl, tell your veterinarian if your pet is also taking ACE inhibitors such as enalapril, potassium sparing diuretics such as spironolactone, ketoconazole, or potassium supplements. Talk to your veterinarian or pharmacist before giving any prescription or over the counter medicines or nutritional supplements. Administer the appropriate amount of capsules based on your dog's weight. Speak with your veterinarian to help you determine the correct dosage for your dog. Store Vetoryl at controlled room temperature (77°F) with excursions to 86° F allowed. Keep this medication away from children and other pets.